Today I grabbed my coffee and scooted out the door with our unruly little dog. 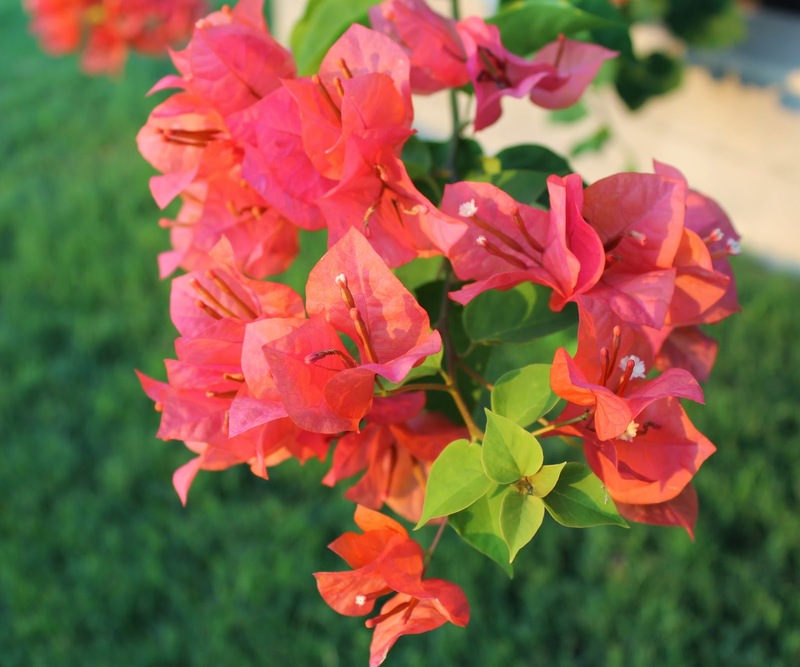 The first thing I saw were these beautiful bougainvillea blooms. Aren't they the most unusual color? They are coral and I normally think of them as purple. This was a happy surprise when the colors popped out. We have been so incredibly lucky in the last week to have rain. It's unusual this time of year especially when we are in drought like this. Everything in our yard is so pretty but summer is beginning to wane. We still have 6 or 8 weeks of heat here but the locusts are sounding different and so are the crows. Those are signs of change in my book. Those sure are pretty and I love the color, too! Flowers always make me happy! I see this blooming and always forget what it's called! Beautiful my friend! Hugs! I'm probably way behind, but I love your header...is it new? Your personal photo is adorable!! Beautiful color! We have had PLENTY of rain over the last 2 weeks! Summer is winding down a little early here. But just as I start to think that I know that it will be blazing hot again! Gorgeous color indeed! I wish summer was waning here but at least the humidity is gone. Enjoy your day. The flowers are so pretty. You captured them beautifully. Hope you're enjoying these few weeks of summer. I've noticed the change, too, Stacey. It's a change in the air here, even the humidity feels a little less...humid! The sun sets a bit earlier, my daylilies are long gone, my zinnias are in full bloom and every farm stand is filled with sunflowers. The kids don't go back for several weeks, so we are still in full summer mode, but I feel it slipping away! PS- Your pictures are lovely! So pretty! We had one that same color for years, I would cut it completely back and pour a whole bag of mulch over the stump in the fall. Each year it came back and got even bigger! But one of the kids fell into it one summer and Maurie said no more bougainvillia :( I think he killed it on purpose lol. Beautiful photos! I love coral colored flowers. The orangey-er the better! Pretty flowers. It has been a little cooler here and a little more rain. For me it is the angle of the sun. Gorgeous color! Seeing that would make me happy too! The colors of these vibrant flowers, would make anyone smile. I am also noticing the change in my part of the country, and it amazes me as to how fast it is happening. Hope your Wednesday is a good one! Such a pretty color! I'm ready for fall but we have several more weeks before we will see any cooler temps. I'm so happy you got rain. I hope California gets some as well. We've had more than our share and I think that's why everything still looks so full of life and lush. In September I can feel fall coming on when the days are a little hazier. I love that time of year. Apples, woodsmoke, early evenings...wait! I love summer, too! Our bougainvillea is purple and doing well despite our drought. I love how it drapes across the wall between our house and our neighbors. Thank you so much for leaving so many kind comments on my blog! I absolutely adore your blog ~ I have spent the last little bit looking around and I love everything. Thanks so much for stopping by! Oh gosh, it's so PRETTY! Words can't describe how much I miss having a colorful, lush, blooming garden. (The heat, and most especially the grasshoppers, have destroyed absolutely everything around here). This pretty pinky/coral is my favourite bougainvillea colour of all, (yes, even more than the red!). How refreshing to get a little rain, to shower some vitality on all the hot and bothered beauties! Send some my way, will you? It is a gorgeous color! We have had rain all this week and it has been so nice as well. Wonderful cooler temps and the garden is loving it. I always look for something beautiful wherever I venture. Surely helps to brighten the day! They are beautiful! One of my favorite flowers. I have a small collection and that color is a favorite. What a beauty! I can only grow them as an annual and I always envy the huge ones I see in California gardens! 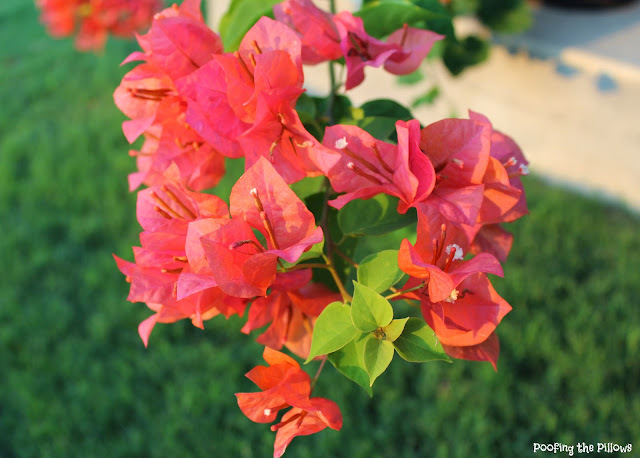 Your bougainvillea is beautiful and you captured it's beauty perfectly in your photographs. So beautiful! I had one in our Florida home and I just adored it. Have not tried to grow one here in the Carolinas. I don't think it would do too well.